The workings of a bituminous coal mine produce explosive coal dust for which adding rock dust can reduce the potential for explosions. Accordingly, guidelines have been established by the Mine Safety and Health Administration (MSHA) about the relative proportion of rock dust that must be present in a mine’s intake and return airways. Current MSHA regulations require that intake airways contain at least 65% incombustible content and return airways contain at least 80% incombustible content. The higher limit for return airways was set in large part because finer coal dust tends to collect in these airways. 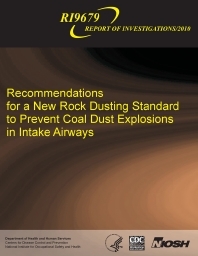 Based on extensive in-mine coal dust particle size surveys and large-scale explosion tests, the National Institute for Occupational Safety and Health (NIOSH) recommends a new standard of 80% total incombustible content (TIC) be required in the intake airways of bituminous coal mines in the absence of methane. MSHA inspectors routinely monitor rock dust inerting efforts by collecting dust samples and measuring the percentage of TIC, which includes measurements of the moisture in the samples, the ash in the coal, and the rock dust. These regulations were based on two important findings: a survey of coal dust particle size that was performed in the 1920s, and large-scale explosion tests conducted in the U.S. Bureau of Mines’ Bruceton Experimental Mine (BEM) using dust particles of that survey’s size range to determine the amount of inerting material required to prevent explosion propagation. Mining technology and practices have changed considerably since the 1920s, when the original coal dust particle survey was performed. Also, it has been conclusively shown that as the size of coal dust particles decreases, the explosion hazard increases. Given these factors, NIOSH and MSHA conducted a joint survey to determine the range of coal particle sizes found in dust samples collected from intake and return airways of U.S. coal mines. Results from this survey show that the coal dust found in mines today is much finer than in mines of the 1920s. This increase in fine dust is presumably due to the increase in mechanization. In light of this recent comprehensive dust survey, NIOSH conducted additional large-scale explosion tests at the Lake Lynn Experimental Mine (LLEM) to determine the degree of rock dusting necessary to abate explosions. The tests used Pittsburgh seam coal dust blended as 38% minus 200 mesh and referred to as medium-sized dust. This medium-sized blend was used to represent the average of the finest coal particle size collected from the recent dust survey. Explosion tests indicate that medium-sized coal dust required 76.4% TIC to prevent explosion propagation. Even the coarse coal dust (20% minus 200 mesh or 75 microm), representative of samples obtained from mines in the 1920s, required approximately 70% TIC to be rendered inert in the larger LLEM, a level higher than the current regulation of 65% TIC. Given the results of the extensive in-mine coal dust particle size surveys and large-scale explosion tests, NIOSH recommends a new standard of 80% TIC be required in the intake airways of bituminous coal mines in the absence of methane. The survey results indicate that in some cases there are no substantial differences between the coal dust particle size distributions in return and intake air courses in today’s coal mines. The survey results indicate that the current requirement of 80% TIC in return airways is still appropriate in the absence of background methane.